By Sanne Wass, 1st August 2014. With a growing black middle class there’s a whole new potential for businesses in the South African townships. But due to lack of recourses, local entrepreneurs struggle to start and develop their businesses. “When I got the idea, I only had 40 rand (£2),” says Lufefe Nomjana. In a white baker’s uniform, he is proudly handing over a loaf of bread to a middle-aged woman. 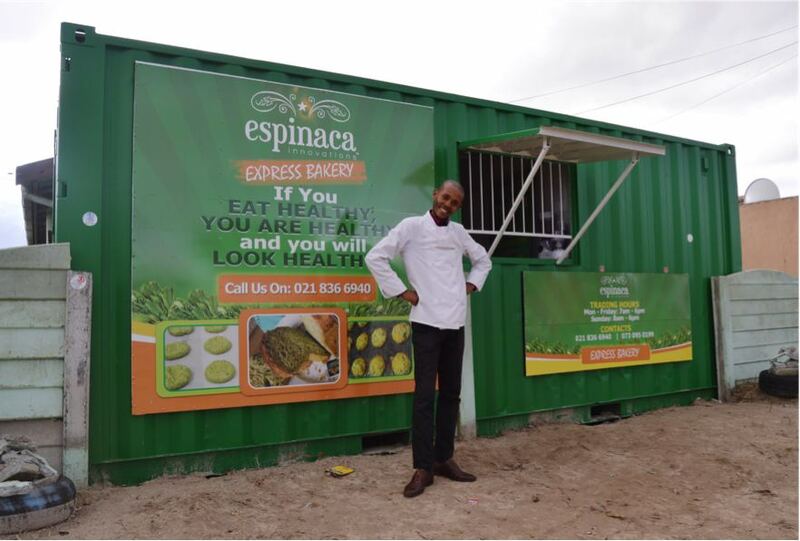 Located in between the poor shacks and street markets of Khayelitsha, Nomjana has transformed a green container into a small bakery shop called Espinaca Innovations, where passers-by can purchase spinach bread and healthy muffins. The now 26-year-old businessman came up with the idea of opening a green bakery two years ago. “I saw there was a dying need for change. People eat very unhealthy food in the townships,” he explains. The so-called townships are home to the most underdeveloped areas of South Africa, struggling with a high level of poverty and crime. They were created during apartheid, when black and coloured people were evicted from the white-only areas. Khayelitsha is the largest township in greater Cape Town, and local tour agencies estimate a population of more than 1.5 million today. Nomjana started baking bread with spinach, using a homemade, secret recipe. But at that time it was just an idea, which Nomjana struggled to turn into a proper business. “It isn’t easy to start as an entrepreneur in a township. I started with almost nothing in 2012, I had to borrow my neighbour’s oven every night, bake the bread before four o’clock in the morning. I had no place to sell them, so I went around knocking on every door carrying the bread in baskets,” he says. Nomjana’s bakery has just enough space for an oven, a counter top, and himself and his wife, with whom he runs the business. After two years of hard work, Nomjana finally had the means to open his shop; he now hopes to open a second in another township in January. According to a recent study “Four Million and Rising” by the Unilever Institute at the University of Cape Town, the last ten years has seen a remarkable increase in the so-called black middle class. From 2004 to 2012 this group has increased form 1.7 million people to 4.2 million in South Africa. Many of these live in the townships. But in more recent studies, Unilever Institute found that a lot of people who had been living in suburbs were now returning to the townships. “Townships are generally becoming a more attractive place to live. There is a strong pour back to the areas because of improvements in infrastructure, but also to be near family and community. So you now see a considerate part of the black middle class living in townships,” Egan says, and adds that townships have started to become their own towns, with satellite TV’s, cars and spending in the weekends. “It’s a huge opportunity for the entrepreneurs. Also because the black middle-class who are not living in townships come back in weekends for cultural events or family reasons. They will spend a lot of money,” Egan says. The young baker Nomjana agrees that there’s a big potential for the township entrepreneurs. The problem is that the successful businesses are mainly coming from outside the townships, while locals are missing out. “There are plenty of locals trying to start up a business here. But they don’t know how to run and grow a business, they don’t understand the market, and if they are offered a job they take it,” Nomjana says. Characteristic of a township economy is a strong informal sector, where businesses are unregistered, operating from homes or streets. Walk down any street in Khayelitsha and you would see it packed with small retailers selling sweets, fruit, clothes, and meat. Elvis Sekhaolelo is the founding director of eKasi Entrepreneurs, a non-profit company that helps and consults township entrepreneurs. He explains how most of the informal businesses are driven by necessity, not opportunity. “You would find a big portion of so-called survivalist entrepreneurs. There are many underprivileged in the township, who are unemployed and in desperate need for some cash. They would start selling anything just to be able to survive,” Sekhaolelo says. This kind of business rarely grows bigger than one person, and it offers little employment and growth to economy. And it is vulnerable when big retail chains expand into the townships. “To be able to create a fast growing economy, entrepreneurship has to be there. But people in the townships don’t see entrepreneurship as a career,” Sekhaolelo says. According to Sekhaolelo, a lot of corporates and investors are “neglecting” the grassroots entrepreneurs like Nomjana. “Young people have realised that there are lot of opportunities, and the mindset is starting to be entrepreneurial. But they are not recognised by the funders and corporate institutions. Therefore there’s a chunk of entrepreneurs that are left behind. They are not able to scale and develop their business further, and they just don’t know where to go,” Sekhaolelo says. Nomjana is one of the young businessmen in Khayelitsha who defied the greatest challenges. But it took him a long struggle to find the support he needed. “Investors don’t trust that you can run a viable business in a township. It was very difficult to find people who would invest in my business. I started in 2012, but I only got this shop three weeks ago,” Nomjana says. His container and two ovens are sponsored by private companies, and with the help of crowd funding – an online platform for raising money – Nomjana managed to fund bicycles to deliver his spinach bread around Khayelitsha. “My challenge as an entrepreneur was lack of resources. My only challenge now is that I need more,” says Nomjana, who with an increasing demand has potential costumers in Cape Town, but can’t afford a car to transport his goods.